It must be an embarrassing situation when you do not know the email address of a friend who has been in your Google Hangouts contact for a long time. However, this situation is possible in many circumstances. For example, you want to send him an email but cannot find his Gmail address or someone has changed his/her Hangouts display name recently and you are unable to recollect that person. If you can find out the email address, it would be easy for you to identify the person who has recently changed Google Hangouts chat display name. There are some methods to find out the email address and Phone Number of a Google Hangouts friend and we are going to explain some of them. 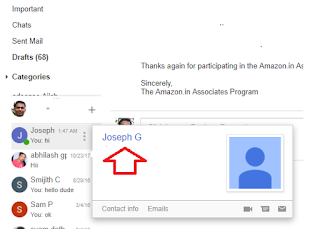 If you are accessing your Google Hangouts through Gmail, in most of the cases you will be able to see the email id by simply placing the mouse over the specific chat friend in the contact list. This method works only if you used his email id on your Gmail before. For example, if it was you who had sent Hangouts invitation to that person using his Gmail id, his email id will be shown whenever you hover over his display name. Though it works most of the time, this method won't work in every case. As I said before, if you didn't use his email address before, Google Hangouts would not display his email id automatically. If it was him who added you to his Google Hangouts group using your email address, there is no way you can find his email address on your hangouts window. In this situation, you must go to his Google Plus page. On his Google Plus page, you will be able to see his public information. If he added his email address as public information, you can find it out there. So if someone listed his email address and phone number as public on Google plus account, anyone will be able to read them. To access Google Plus profile of your Hangouts chat friend, you should click on the display name. If that person has a Google Plus profile, you will be redirected to his public profile page. What if your Hangouts chat friend does not have an email address on his Google Plus public profile page? In this situation, you have nothing much to do except asking him directly his email address. The same goes for his phone number too. If one person does not share his email address and phone number, the only way to get them is to ask them directly.